SUNT DE ORIGINE ROMANA SI LOCUIESC IN ITALIA DE MAI MULTI ANI IMPREUNA CU FAMIGIA MEA. 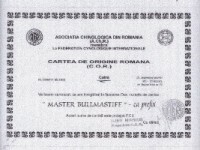 CITEVA ZILE IN URMA ,CUMNATA MEA ITALIANA CARE LOCUIESTE IN MILANO, MI-A SPUS CA A CONTACTAT FIRMA DUMNEAVOASTRA PENTRU A CUMPARA UN CATELUS BICHON FRISE. SPER CA REUSCITI SA GASITI PENTRU NEPOTUL MEU CATELUSUL SI CAND VOM VENI IN VACANZA ,TRECEM SA VA SALUTAM. How did thuh chickens dance at thuh Christmas party? Chick to chick!